We hope representatives from all counties, tribal communities and public awareness campaign partners can join us! 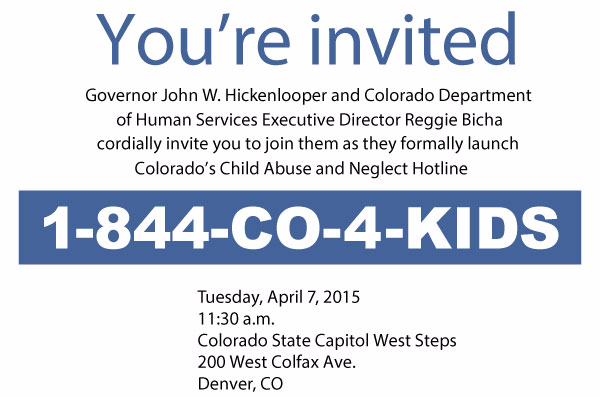 The statewide hotline for reporting child abuse and neglect launched on January 1. The Public Awareness campaign is launching this week! 3. Join the Public Awareness Subcommittee: a group of stakeholders from across the state gather monthly to discuss the campaign and provide feedback on campaign elements. Anyone can join this group and attend the meetings. 4. Spread the Word: we are creating an electronic campaign toolkit full of resources (brochures, posters, social media content, etc.). This toolkit will be available on our website in April. Please help us spread the word by using these resources, and let us know if we can provide anything else to help you publicize the hotline. Please encourage your colleagues and partners to get involved!